We were able to accomplish all of these things in under an hour (yes!) and also had time to find a Starbucks and grab a coffee before boarding the Narita Express train to Shibuya. We plumped for the Green passes (i.e. first class) since our 6’4″ German friend could use the additional room (not that I mind for myself 😉 so we were able to sit in the plush leather chairs on the train. 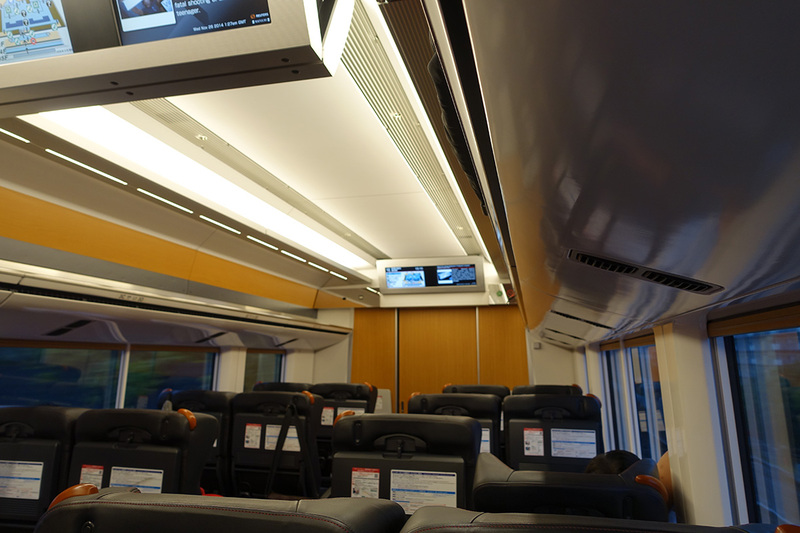 It was a nice way to travel to our stop at Shibuya Station. We decided to stay in apartment rentals (Air BnB) during this trip and were given directions to the first apartment we would be staying in and the directions were spot on. It took us about 5 minutes to get from the station to the apartment, which wasn’t bad at all. 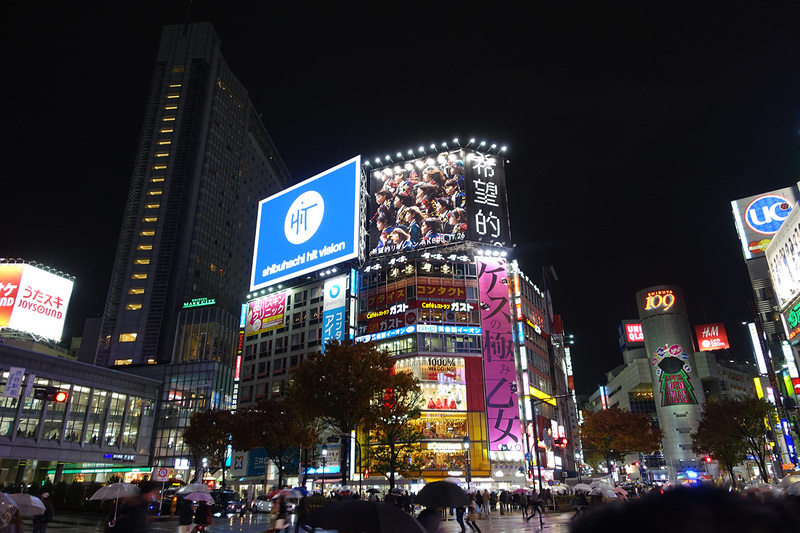 We’re fortunate that the place is centrally located and takes us no more than 5-10 minutes to get to the station and to the Shibuya scramble crossing. 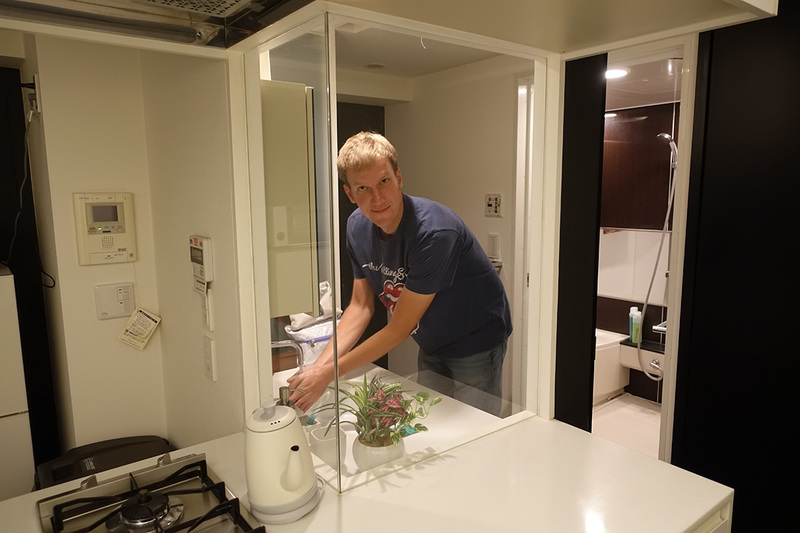 One interesting feature of the apartment is that the bathroom has a window into the kitchen and living area, which was a little unexpected. 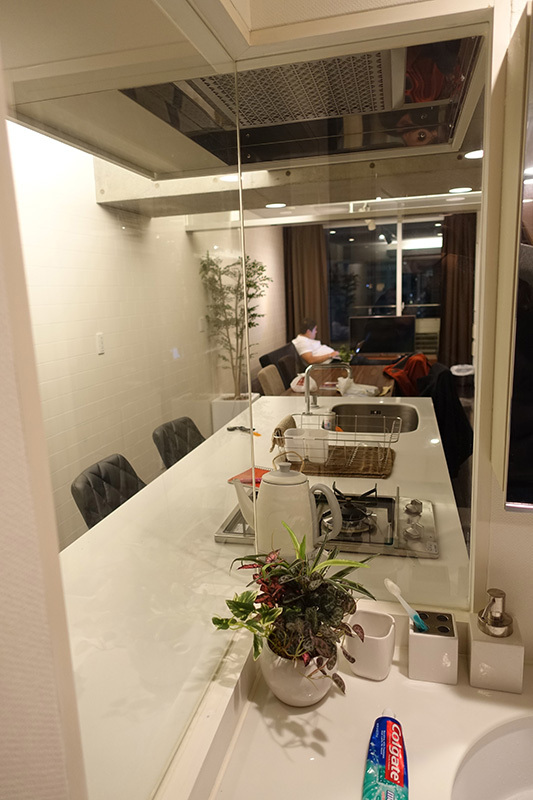 Here is the view from the bathroom sink area into the living room. 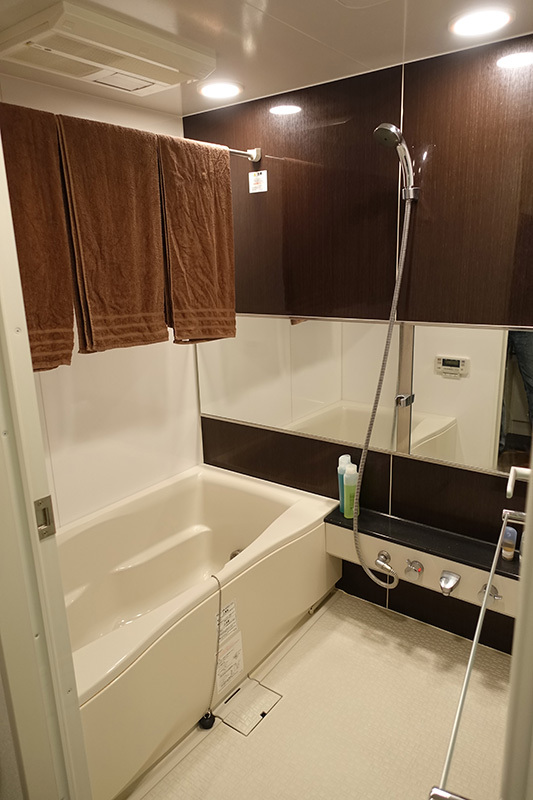 The bathroom itself has a tub I wish I could take home with me since its sides are high enough that one can really soak in it. 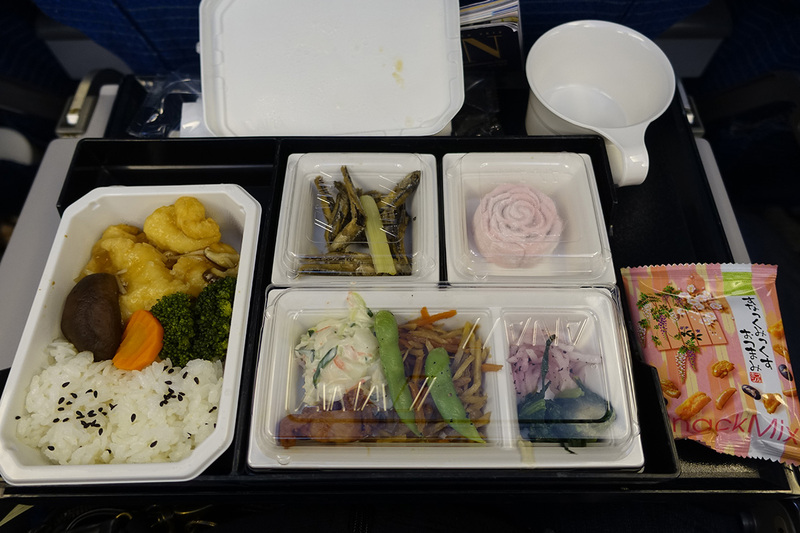 I know this is typical for Japan but I really want one – why don’t we have this in the US?! This is awesome! 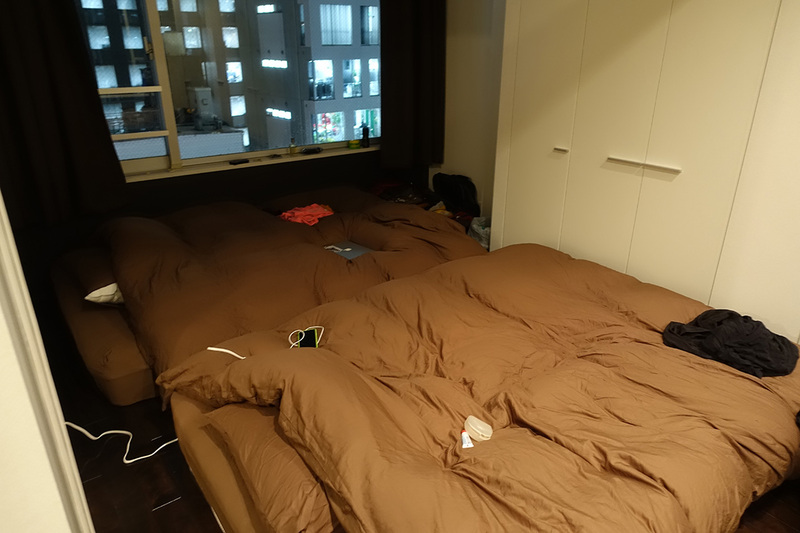 After our time in Taiwan on the good-for-your-back (yeah, right) hard mattresses, these futons are incredibly comfortable – soft and supportive. Again, when America decided to make “futons” we really messed it up – we should have just done the real deal because these are super comfy! 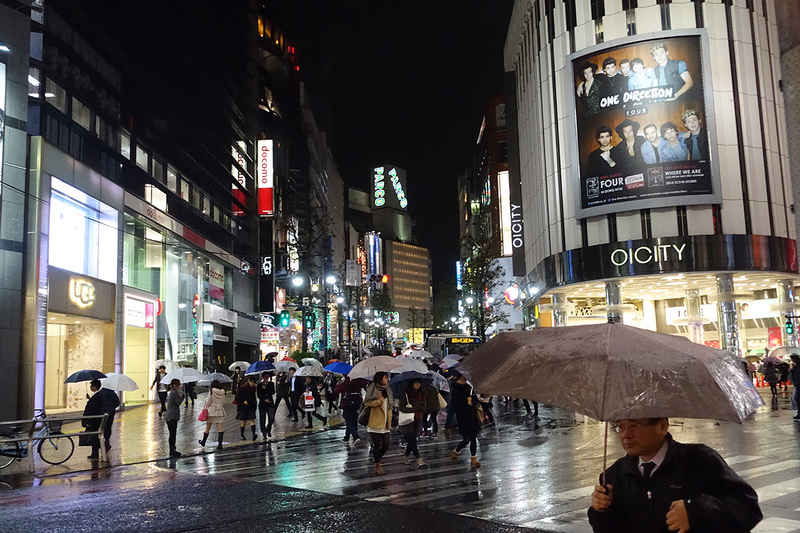 After settling in a little, we decided to head out into the rainy night to check out our neighborhood and find something to eat. 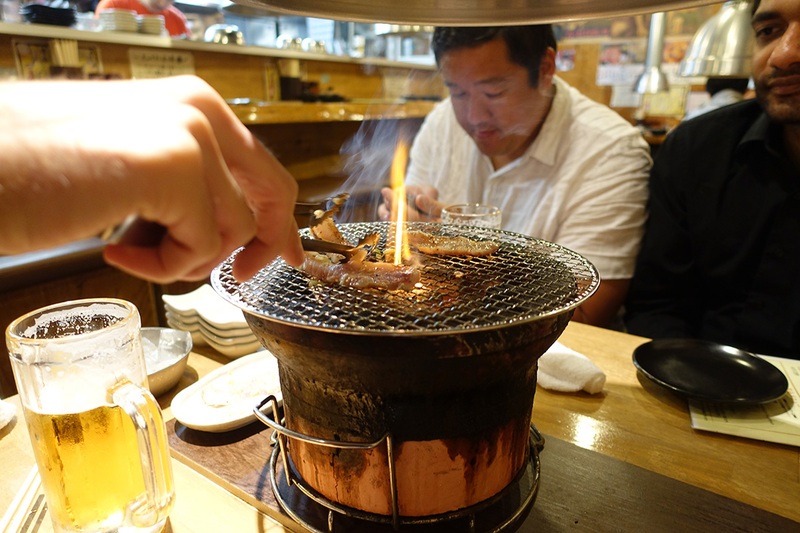 We took a wrong turn somewhere and, instead of a Ramen shop, we ended up at a Yakiniku place. It was pretty cool, though why I was the one who knew how to use the grill to cook meat was a bit disturbing since I’m a vegetarian, after all. 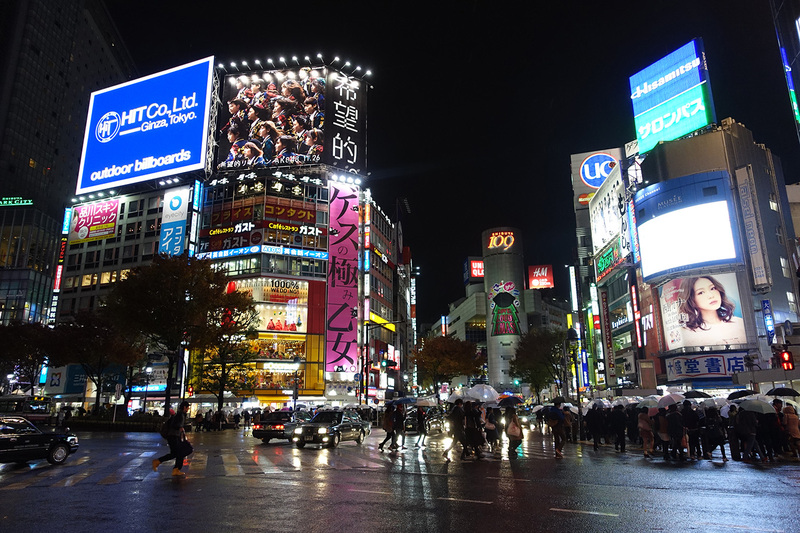 We just had a little to eat (and by “we” I mean the 3 guys – I just had a beer) and then we ventured out to check out the famous Shibuya scramble crossing. It was just as bright and packed with people as I had heard. Even in the rain, the energy of the place was amazing. 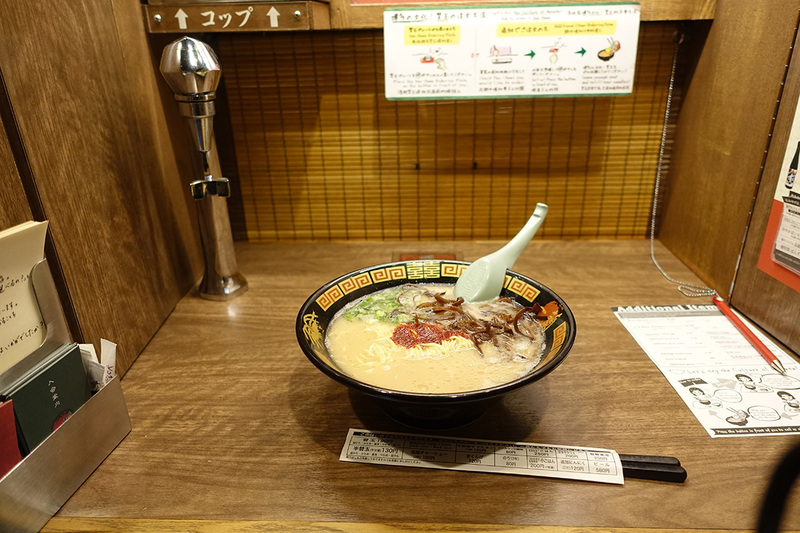 We finally had good directions to a highly-rated Ramen place (Ichiran). We had to wait in line a bit and then we were in for a surprise: ramen is ordered via vending machine. I kid you not: you select which ramen you want from a machine, pay there, then you get some tickets with your order info. We waited to be seated and then there was yet another shock: instead of tables, each person sits at a barstool with dividers on the bar between him and the people sitting next to him. There is a curtain ahead of him where he can give his order info tickets to a person behind the curtain whose face he cannot see. Then that person closes the curtain and disappears. A short time later, the curtain opens and, ta da! Ramen! I have to say that this Ramen was really good. I’ve had a lot of Ramen in the bay area and nothing compares to the flavor of the broth and the noodles. It was the perfect thing to have on such a cold rainy night…or any night, for that matter. After savoring the meal, we ventured out into the cold wet weather again to explore a bit more off the main scramble crossing. 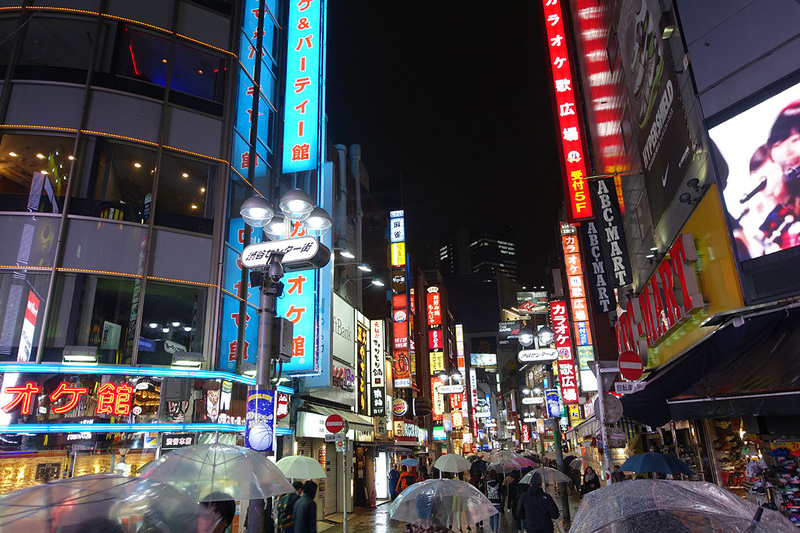 We also found the karaoke bar, Karaoke-kan, that was featured in the film Lost in Translation. It’s the building with the bright blue sign in the photo below. We’ll definitely be going. After wandering around for miles we had reached our saturation point and decided to head back to get some sleep for our first full day in Tokyo. Day 2 post will be coming up. I love that apartment! It’s like my dream home! Btw, new follower here. Great blog!